By Elizabeth Carlton and Rachel Perez for Edwardsturm.com. 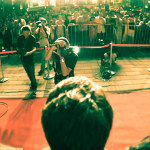 Advertising’s aim is to connect with its target audience in the places they frequent most. Exposure, exposure, exposure! So is it any surprise to any of us that Facebook is one of the leading “billboards” in digital advertising? Businesses are finding a strong ROI on their Facebook ads thanks to the social media platform’s remarkably accurate targeting tools. With more than 1.4 billion users and more than 900 million daily visits, Facebook Ads are capable of reaching mass consumers… all within your scope of interest. The key to success is creating an effective Facebook campaign and targeting it to the right audience. 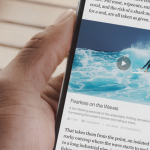 Unlike traditional advertising means, Facebook Ads are organic. With a highly informative backend, you can analyze your campaign results in real-time, and adapt your ad sets based on what’s working, and what’s not. First, you need to choose your campaign objective. Are you trying to build brand recognition? Draw visitors to your website? Convert clicks into purchases? Don’t be vague. Establish a clear goal for your campaign, and then gear your advertisements around it. When it comes to advertising delivery, you have choices. Video media, photo ads, Canvas “stories,” and carousel ads are all different ways to display your message. All of them have their own unique advantages. 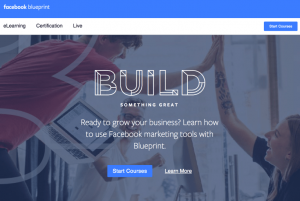 In fact, Facebook has an entire training program called Facebook Blueprint that teaches you how to utilize them to gain the best ROI. Once you have designed your ad, you need to define your audience. 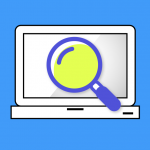 This is done by narrowing down your targeting via location, interests, what individuals buy online and offline, age, gender, salary, and much, much more. The reach and accuracy is remarkable, allowing you to hyper target and save certain audiences that respond well to your campaigns. This is why it’s so beneficial. Facebook Ads are “living organisms” that can change throughout the campaign in different ways, so you can optimize what’s working. This approach is best completed by generating multiple, different ad sets based on an educated hypothesis, and actively narrowing it down to the most effective approaches throughout your campaign. Using iteration is key and it’s what allows advertisers to see 10X ROI over time. All of this is can be done affordably- allowing any sized business to participate. Pick your budget and Facebook will calculate how far a campaign will reach based on the information you input and the objective you’re trying to achieve. East & Greenwell Insurance wanted to grow their audience and increase prospects for their competitive services. Insurance is a hot topic, particularly in Southwest Florida where life insurance is a common need, and property insurance is top of mind because hurricanes threaten homes every year. They turned to our agency to help them hone their marketing message and craft social media campaigns that worked. Facebook post boosting implementation to increase interactions and exposure on their individual posts. Videos, blogs, and two landing pages for campaigns in order to circulate East & Greenwell’s brand and services. Equipped with strong, visual Facebook posts and a concise, engaging commercial, East & Greenwell had the quality content they needed for success. Facebook posts were allocated a modest budget. Each boosted post was chosen carefully based on its content- with detailed targeting focused on appropriate demographics, behaviors, and interests relative to its message. The posts were chosen selectively, given the time of year and current climate. Topics included hurricane safety posts prior to the arrival of Hurricane Matthew, student loan advice prior to the start of a new school year, and life insurance in cohesion with their latest blog post. 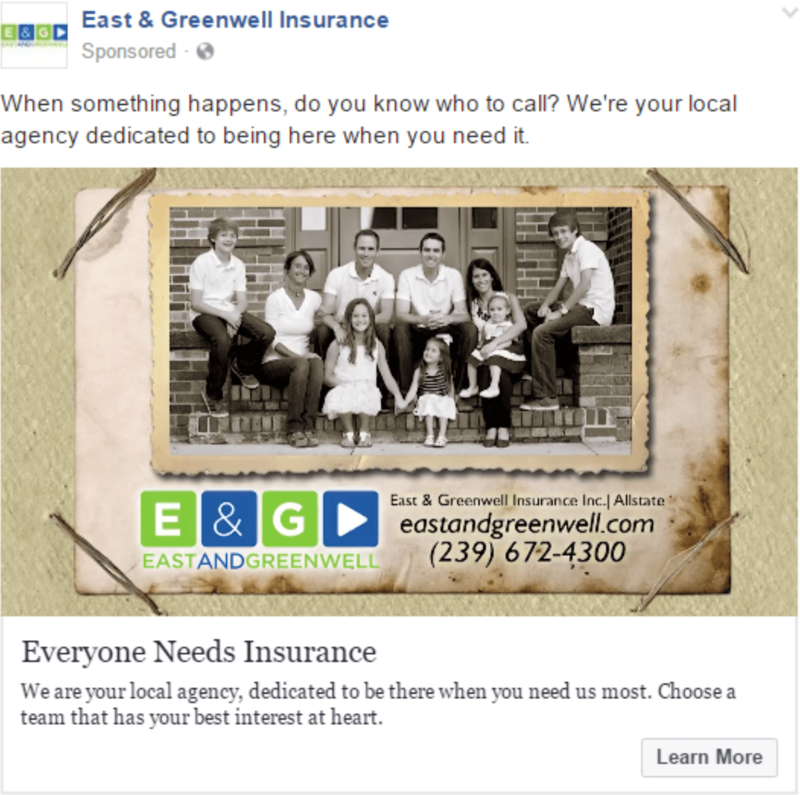 Using Facebook Ads, users were invited to “Like” East & Greenwell Insurance and follow up with any questions. The video and blog post campaigns were a completely separate endeavor designed to increase visits to their website. Fortunately, East & Greenwell Insurance already had a professional, concise commercial that perfectly fit their brand, so producing that content from scratch wasn’t part of the process. The video campaigns were defined by careful demographic targeting, income, behaviors, and, of course, location. 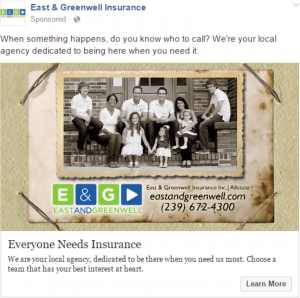 Between ad campaigns and targeted post boosting, East & Greenwell Insurance has seen their post engagements increase exponentially. Additionally, their page views experienced a 200% increase. Each commercial campaign garners tens of thousands of views, with blog posts and landing page clicks in the triple digits. Our agency has been working with Kinetico of Southwest Florida to convert clicks into calls. The key? Optimizing their Facebook advertisements with a pinpoint focus on location. Kinetico of Southwest Florida specializes in water filtration, water softening, reverse osmosis, and drinking water systems for home and commercial use. Facebook advertisements give businesses the opportunity to define a highly concentrated audience within very specific locations. To coincide with Kinetico installations, our agency created community-specific ads within 2 miles of the installation, capturing the respective community. With carousel advertisements, photos include the community entrance with the neighborhood clearly marked, Kinetico vans in the driveway, and a clear call-to-action button. As you can see from the ad above, the text is concise, identifies common water issues in the area, and has an obvious call-to-action. The advertisements are allocated a modest budget and have already yielded two new clients, leading to average transactions of $3,500. Kinetico of Southwest Florida has been so pleased with their social media campaigns, that they have allocated a stronger budget and ceased television advertisements. These ads will be extended to include over a dozen more communities, with unique messaging and images for each location. 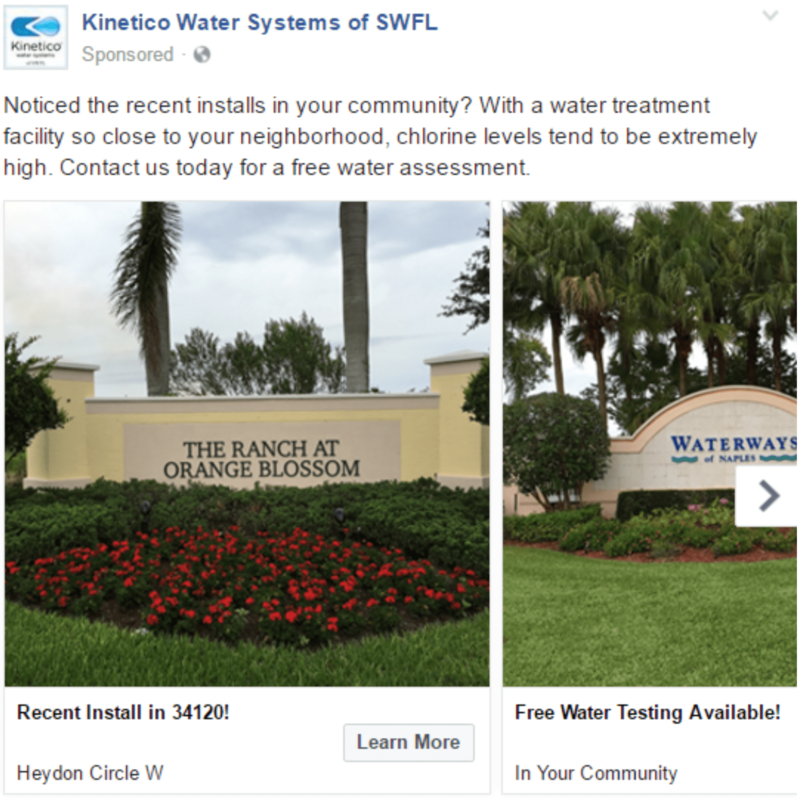 In addition to community campaigns, Kinetico’s already strong brand recognition is being increased by also leveraging communities on Facebook. If only we could say, “Follow steps A-Z,” to gain the best results every time on your Facebook advertisements, we would. However, advertising has never been that simple, now or in the past. There is no one path to success with Facebook Advertising, and you should be wary of any blog or article that tries to tell you otherwise. Instead, a strong campaign is based on the strength of the message and the relevance of the audience to whom it’s delivered. This is an art form, and it changes from one campaign to the next. However, if you use the tips provided in this article and by Facebook’s Blueprint tutorials, you’ll discover a method to the madness. The benefit of Facebook Advertising is that you can adjust your campaign as it progresses to align with the results you’re aiming for. This is a relatively new form of flexibility advertisers didn’t have five years ago. Use it to connect to your consumers in more intimate ways by building an ongoing relationship that gets them listening, talking, and interacting with your brand. Elizabeth Carlton and Rachel Perez are digital marketing consultants at iPartnerMedia in Bonita Springs, Florida.